“Scout” belongs to the Boy Scouts of America Troup 61 in Dexter, Maine. The Boy Scouts and the Tri-County Tech Center in Dexter did a fantastic job assembling this boat. They enjoyed excellent community support in putting their boat together and this will be its 2nd voyage. In early August 2016, she is making a close approach to Bermuda and Andrew Parish, a long time champion of miniboats along the entire US Eastern Seasboard, is watching closely. As of August 8, 2014 Scout just is shy of 14 miles ENE of the easternmost tip of Bermuda. It appears to be tough to get a BIOS boat out to SCOT’s location at this point. As the prevailing strong westerlies are forecast to hold firm for 2 more days, but then swing into a generally NE-SE pattern for at least 4-5 days. This may return Scout within a recoverable distance for participants to find. You can see the track here. In October/ November 2016 Scout once again came close to Bermuda, where Ariadne, Educational Coordinator of Educational Passages sailing to Bermuda on a 72ft Cutter named Sea Dragon, came close to being able to retrieve her. Alas at the last minute SS Scout headed south and is still at large. Earlier in 2013 it sailed from The Bahamas to Nova Scotia in 31 days. In December 2013 she was re-launched off the Georges Banks by lobstermen Captain Todd Ellis out of Newington, NH. It joined a fleet of 8 other boats including a few launched from the Canary Islands. We expect these boats to circle the Atlantic in a clockwise direction and anticipate they’ll make several stops. We hope the finders will contact us, fix the boat up as needed and re-launch her so she can continue her journey-maybe back to America. See most recent pings "http://www.nefsc.noaa.gov/drifter/drift_ep_2013_2.html"
“Scout” belongs to the Boy Scouts of America Troup 61 in Dexter, Maine. 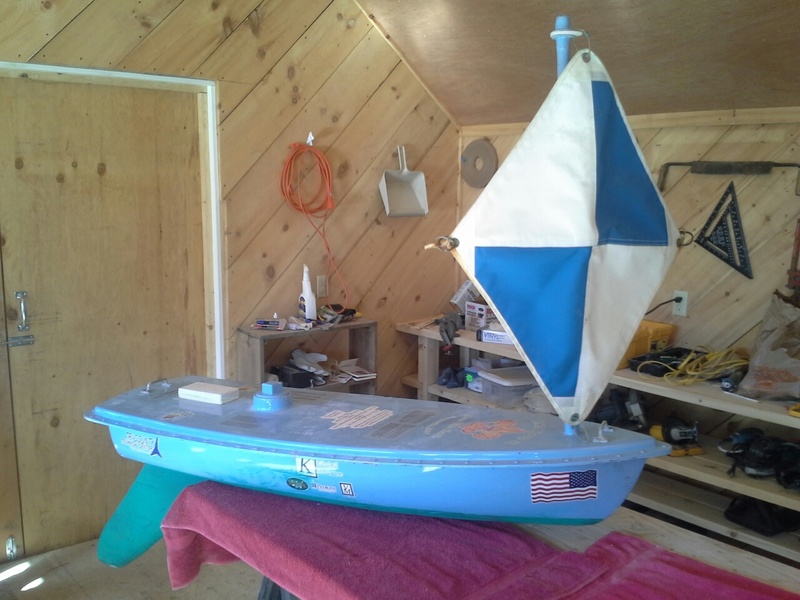 The Boy Scouts and the Tri-County Tech Center in Dexter did a fantastic job assembling this boat. They enjoyed excellent community support in putting their boat together and this will be its 2nd voyage. Earlier in 2013 it sailed from The Bahamas to Nova Scotia in 31 days. In December 2013 she was re-launched off the Georges Banks by lobstermen Captain Todd Ellis out of Newington, NH. It joined a fleet of 8 other boats including a few launched from the Canary Islands. We expect these boats to circle the Atlantic in a clockwise direction and anticipate they’ll make several stops. We hope the finders will contact us, fix the boat up as needed and re-launch her so she can continue her journey-maybe back to America. In early August 2016, she is making a close approach to Bermuda and Andrew Parish, a long time champion of miniboats along the entire US Eastern Seasboard, is watching closely. As of August 8, 2014 Scout just is shy of 14 miles ENE of the easternmost tip of Bermuda. It appears to be tough to get a BIOS boat out to SCOT's location at this point. As the prevailing strong westerlies are forecast to hold firm for 2 more days, but then swing into a generally NE-SE pattern for at least 4-5 days. This may return Scout within a recoverable distance for participants to find. You can see the track here. In October/ November 2016 Scout once again came close to Bermuda, where Ariadne, Educational Coordinator of Educational Passages sailing to Bermuda on a 72ft Cutter named Sea Dragom, came close to being able to retrieve her. Alas at the last minuet SS Scout headed south and is still at large.